A pipelines build quits with "unexpected EOF" with no further information. During a docker build, while running Python tests the message unexpected EOF displays before the Pipelines build fails. The docker build command is spawned and limited to 2G of memory using the -m 2G flag in docker. The issue is not reproducible locally in docker at all, so I'm not really sure what to do. This seems like maybe expected behavior? Without any message about what happened or documentation, at minimum this should be a task to update docs. 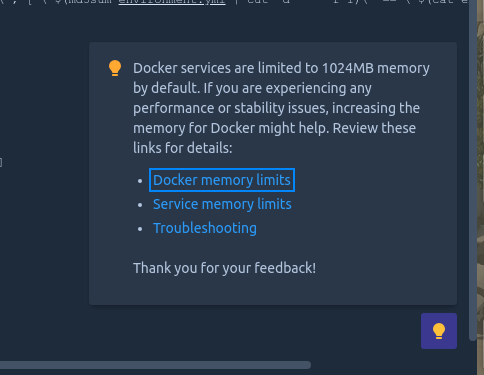 By default, the Docker daemon in Pipelines has a total memory limit of 1024 MB. I confirm that increasing the memory resolved the exact same issue for me. Thanks!